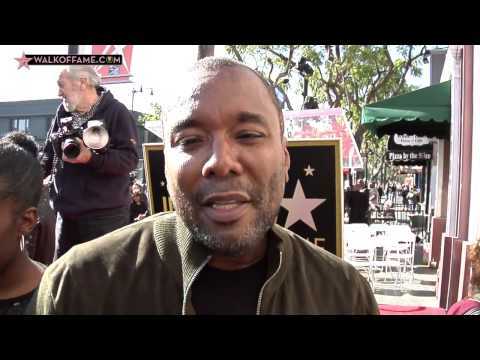 The Hollywood Chamber of Commerce honored director Lee Daniels with the 2,595th star on the Hollywood Walk of Fame today on Friday, December 2, 2016 at 11:30 a.m. PST. The star in the category of Television was dedicated at 6533 Hollywood Boulevard in front of the Hudson Apartments. Helping Emcee and Hollywood Chamber President/CEO Leron Gubler to unveil the star were Queen Latifah, Gabourey Sidibe and Jussie Smollett. The Hollywood Chamber of Commerce which administers the popular star ceremonies encourages fans around the world to watch the event live exclusively on www.walkoffame.com. Lee Daniels was born in Philadelphia in 1959, and his career was started running a nursing agency in Los Angeles. Daniels’ work includes the hit Fox television series EMPIRE, for which he wrote and directed the pilot and continues to serve as an executive producer on the series. This one-hour family drama is set in the world of a hip-hop empire which features both original and contemporary music. Terrence Howard and Taraji P. Henson star. The show premiered in January 2015 and broke ratings records during its first season, and continues to be broadcast television’s highest rated drama. In 2015, Daniels signed an overall development deal with 20th Century Fox Television where he continues to create develop, write, direct and supervise new projects under his Lee Daniels Entertainment banner. His first project under the deal is STAR, a show centered around three young women in a musical group in Atlanta, starring Queen Latifah and Benjamin Bratt, along with three female newcomers. The show will have a special premiere on December 14, following the EMPIRE winter finale, and then premiere in its regular time slot on Wednesday, January 4. Daniels’ career first began in the film industry. He is an Academy Award®-nominated filmmaker whose work is trademarked by authenticity and candor, providing audiences with a unique and refreshing experience and character insight with each of his projects. In 2013, he released the critically-acclaimed box office smash LEE DANIELS’ THE BUTLER, an epic drama set against the tumultuous political backdrop of 20th century America which tells the story of Cecil Gaines played by Forest Whitaker, an African American butler who served at the White House during seven presidential administrations between 1957 and 1986. The film, released by the Weinstein Company, held the No. 1 box office spot for three consecutive weeks, and has to date grossed over $175-million worldwide. Daniels is also known for his Academy Award®-winning film PRECIOUS: BASED ON THE NOVEL PUSH BY SAPPHIRE. The film was adapted from the New York Times-bestselling novel “Push by Sapphire” (a.k.a. Ramona Lofton). PRECIOUS was nominated for six Academy Awards®, including nominations for Daniels in the categories of Achievement in Directing, and Best Motion Picture of the Year, and wins in the categories of “Best Performance by an Actress in a Supporting Role” and Best Writing, Adapted Screenplay. SHADOWBOXER marked Daniels’ directorial debut. Following the film’s world premiere at the Toronto International Film Festival, Daniels was also nominated for the New Directors Award at the 2006 San Sebastian Film Festival. Daniels’ production company, Lee Daniels Entertainment, made its feature film debut with MONSTER’S BALL, making Daniels the sole African-American producer of an Oscar®-winning and Oscar®-nominated film. Daniels also produced THE WOODSMAN which was nominated for three Independent Spirit Awards. The film received the CICAE Arthouse Prize at the Cannes Film Festival, the Jury Prize at the Deauville International Film Festival, and Special Mention for Excellence in Filmmaking from the National Board of Review. In 2012, Daniels released THE PAPERBOY, which he wrote, directed, and also produced. The film, which stars Matthew McConaughey, Zac Efron, John Cusack, and Nicole Kidman, is based on the 1995 novel by Pete Dexter. The film premiered at the 2012 Cannes Film Festival, and was released by Millennium Entertainment. In addition to his successful film career, Daniels is an advocate, philanthropist, a longtime LGBT activist, and a supporter of many charitable organizations. He sits on numerous boards including Ghetto Film School, a non-profit which helps to educate, develop, and celebrate the next generation of great American storytellers.